Trees experience many kinds of weather patterns in their life time and will grow in a wide variety of conditions, these environmental factors will influence the way that they respond. As trees mature limbs can become prone to weather damage from high winds, more so if they have not developed strong enough unions. We can identify weak limbs and attachment points and prescribe suitable tree restraint systems. The unique tree restraint system consists of a cable that stretches to allow the branches to flex naturally. 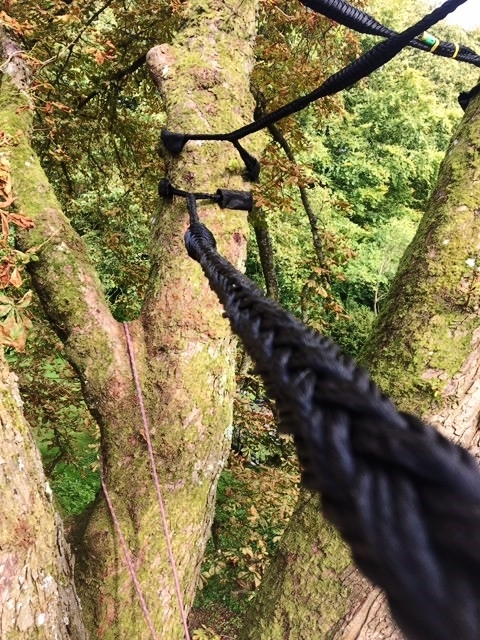 The system utilises a special splice loop around the tree branches to avoid girdling and grips tightly under load. Tree restraint systems contribute to preserving valuable trees inexpensively and to minimise risk. The restraint systems are only designed to support branches from falling if they break. Please note that bracing systems require regular (annual) checks as the loop needs to be able to grow with the tree and doesn’t grip too tightly when underweight.